Many customers throughout the world have requested us to provide them with individual doses of Ivermectin for their birds. Simply put the contents of the bottle in 1 gallon of drinking water, no fuss, no measuring errors. In the evening, just before the birds go to sleep, remove all of the drinking water from the cages or aviary. The next morning, the birds will be thirsty. Use a clean, sterilized water container and vigorously shake the gallon after you add the Ivermectin. Usually, one drink will help eliminate internal and external parasites, including scaly feet and scaly legs. Leave the treated water before the birds until they drink all of it or until the next day. Refrigerate any remaining mixture which can be used for treatment again in 14 days. Many bird fanciers throughout the world treat all their birds with the above-mentioned method twice a year, in January and again at the end of the breeding season. Be careful, Ivermectin is a very powerful parasiticide. An overdose may kill your birds. 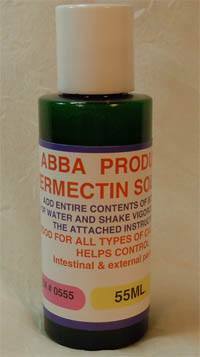 Do not administer Ivermectin straight from the bottle. I recommend Ivermectin be used once every 3 months for healthy flock management of Lady Gouldian finches.